I own an electric vehicle. I may own an electric vehicle during the life of my solar energy system. Can be 50% cheaper than grid power - It is common knowledge that the solar power you produce from your home’s solar energy system is much less expensive than using grid power. The equation is simple: Having solar + electric vehicle = maximum energy savings. When you purchase a solar energy system, you qualify for the 30% federal tax credit on your system. This brings the price down on your home power plant which translates to additional savings on the cost of the energy to charge your electric car. Standard electric vehicle charging at home is too slow. When you buy or lease an electric vehicle, the dealer sends you home with a charging cable that plugs into your home's standard 120V outlet. The problem is that 120V power can only charge your car's battery at a rate of approximately 4 miles per 1 hour of charging. Is that fast enough to give you the range you need for the next day of driving? At some point you'll want to charge your battery up to four times faster with a Level 2 charger. All in, installing a separate Level 2 EV charger can easily cost $1,600 or more. That cuts deeply into the potential energy savings you are trying to get from your electric car. Luckily SolarMax Technology has the perfect solution – the electric vehicle charging inverter. When you get solar panels installed on your home, one of the main pieces of equipment that converts DC energy into the AC energy that your home uses, is the inverter. When you buy a solar energy system for your home from SolarMax, you can choose an inverter with integrated EV charger. 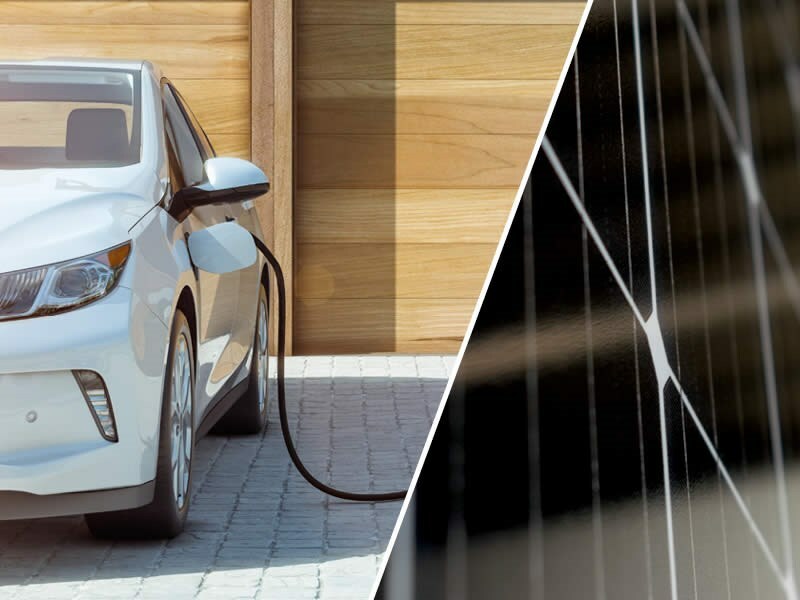 This saves you the cost of buying a separate Level 2 EV charger, finding and hiring a licensed electrician, and the required installation materials. This can be a savings of at least $1,600. In addition, all your solar installation costs can be claimed in your 30% federal tax credit. An EV charging inverter from SolarMax can provide even faster charging during the day when your solar panels are producing electricity. This solar boost mode can increase standard Level 2 charging rates up to 25%. The electric vehicle charging inverter from SolarMax allows you to schedule your vehicle charging times from an app on your smart device. For those of you who are on a Time-of-Use rate plan with your utility (such as SDG&E, SCE, or PG&E), you’ll want to charge your vehicle later at night when rates are more affordable and you get the most value from the surplus of solar energy you were credited for during the day. Since the charger works quickly at Level 2 you don’t need to have the car plugged in for over 12 hours during the most expensive early-evening energy rates to get a full day’s worth of driving charged in. When you plug your electric vehicle into the wall socket without solar, you are powering your car from the electrical grid. Depending on your utility, about 40% - 60% of grid power is still supplied by power plants fueled by fossil fuels and non-renewable energy. Does the idea of driving around a coal-powered car bother you? Then consider the alternative – power your car on sunshine. By charging your electric vehicle with your own solar panels, you can offset the fossil fuel grid power 100% and know that your vehicle truly leaves a carbon-neutral footprint on the environment. Reach out to SolarMax Technology for guidance on how to take advantage of solar energy. We’ll show you how simple it is to get a premium quality solar energy system designed, engineered and assembled here in the USA with the best financing in the industry. A friendly SolarMax solar consultant will provide a no-obligation evaluation of your home and driving energy needs and let you know how many solar panels will be required to meet all your energy needs. An experienced SolarMax system engineer will design a custom solar energy system that produces the maximum amount of energy so that you get the most value out of your investment. The in-house finance department will create an affordable financing package to meet your financial goals and maximize your savings.